Being Milan seat of the future World Expo, the city will undergo lot of changes, urban and architectural improvements generated from projects of famous architects and engineers who, by 2015, will turn Milan into the centre of the world. The old historical district of the Fair in Milan will be dismantled and the new fair place of the Rho Pero enlarged. City Life is a project studied by three famous international architects Zaha Hadid, Arata Isozaki and Daniel Libeskind to retrain the old location of the fair plant. City Life is a district that will rise on an area of about 255,000 mq and it schedules the creation of the largest pedestrian area in Milan, the creation of a park that will cover the 50% of the surface available, and residential areas, structures for various services, the Museum of Contemporary Art planned by Libeskind with the collaboration of the Triennial of Milan, and the Building of the Sparks (Palazzo delle Scintille), that wants to be a wing of the district dedicated to children. But the most disputable part of this project is the expected construction of three skyscrapers (among those, the "sbilenco" of Libeskind, not appreciated by everybody) to give hospitality to the business sector, and that could be used in the future as hotels. In an old abandoned area of the Alfa Romeo company, a wide urban park with a residential area and several structures for services will be prepared. Projects for the improvement of the area around the Garibaldi Station: here the European Library of the Information and Culture and an area dedicated to fashion field, with a museum and services centre, will be build. 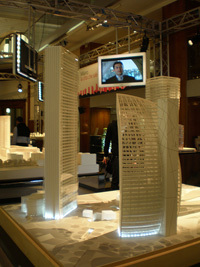 A Tower of 80 mt will give hospitality to the new seat of RCS–Rizzoli. 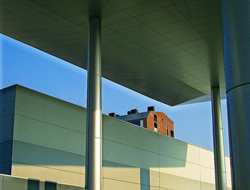 Cerba: one of the most advanced European–serving centre of biomedical research, in the south of Milan.